A unique and colorful spin on birthday cakes! These stacked cupcakes trimmed with Jelly Belly jelly beans are simple to make, and make a special day even better. Recipe makes 4 Party Perfect Cupcakes. Divide the vanilla frosting into 4 mixing bowls. Tint each bowl a different pastel color (green, orange, pink, and blue) with the food coloring. 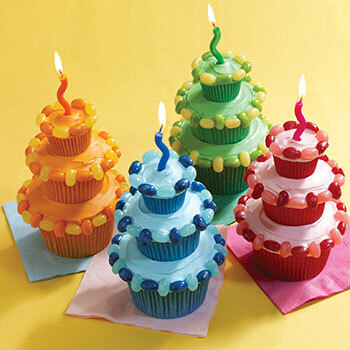 Working on one party cupcake tier at a time, spread tinted frosting on top of cupcakes in like-colored paper liners and make smooth. Using matching jelly bean colors, arrange alternate color Jelly Belly jelly beans around the outer edge of each cupcake, one lengthwise and one crosswise. Stack the cupcakes, pressing the top cupcake into the frosting to secure. Insert a candle in the top center cupcake if desired. Repeat with the remaining cupcakes and jelly beans.